The N7.3tn budget has a total capital vote of N2.24tn, representing 30.7 per cent while the recurrent component stood at N2.98tn with the rest allocated for debt servicing. 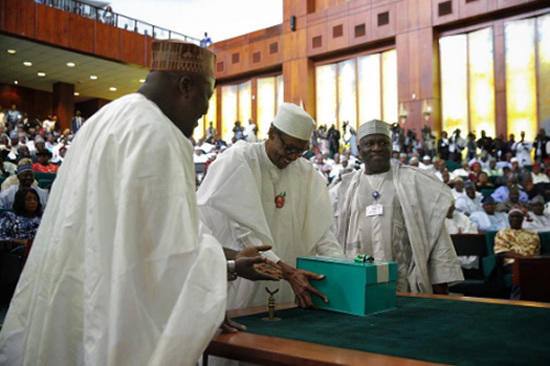 The Presidency, which includes some parastatals, will spend a total of N132.47m on the items. The State House Headquarters leads the pack in terms of sewage as it will spend N52.83m on sewage charges. The State House Liaison Office in Lagos will spend N10m. The Office of the Senior Special Assistant to the President on Sustainable Development Goals will spend N1.8m on sewage charges while the Office of the Chief Economic Adviser to the President will spend N3.71m. The National Institute for Policy and Strategic Studies, Kuru, will spend N7.07m on sewage and fumigation; the Bureau of Public Enterprises, N346, 400; and the Economic and Financial Crimes Commission, N19.5m. Others are the Bureau of Public Procurement, N3m; the Nigerian Extractive Industry Transparency Initiative, N3.31m; the Nigeria Atomic Energy Commission, N5.6m; and the National Emergency Management Agency, N25.3m. On the other hand, the Ministry of Finance and its parastatals such as the Office of the Accountant General of the Federation among others will spend N108.57m on fumigation and cleaning while N16.97m would be used to clear sewage in 2017. For the Ministry of Industry, Trade and Investment and its parastatals such as the Standards Organisation of Nigeria and the Consumer Protection Council among others, the sum of N75.96m is allocated for fumigation and cleaning while the proposed spending for sewage is estimated at N6.46m. Similarly, the sum of N53.03m is allocated to the Ministry of Budget and National Planning and its parastatals such as the National Bureau of Statistics and the Budget Office of the Federation, among others for fumigation in 2017. For clearing of sewage, the budget ministry and its parastatals are allocated a total sum of N12.48m for the 2017 fiscal year. The Ministry of Science and Technology and its parastatals such as the National Agency for Science and Engineering Infrastructure among others, got a total allocation of N83.06m for fumigation in 2017 while sewage charges have been put at N0.4m. While no amount is budgeted as sewage charges for the Ministry of Health, a total of N11.99m is budgeted for some of the parastatals under the ministry as sewage charges. The bodies are the National Health Insurance Scheme, N1, 200,000; Radiographers Registration Board, N400,000; the Obafemi Awolowo University Teaching Hospital, Ile- Ife, N1,170,465; Abubakar Tafawa Balewa University Teaching Hospital, N500, 000; and the Federal Specialist Hospital, Irrua, N900,000. Others are the Federal Neuro Psychiatric Hospital, Yaba, N625,484; Federal College of Complementary and Alternative Medicine, N433,484; National Orthopaedic Hospital, Enugu, N164,352; and the Federal Medical Centre, Kogi, N3,715,200. Similarly, FMC, Bayelsa, got N110, 045; Federal School of Medical Laboratories, N1, 405,600; Nigeria Institute for Medical Research, N300, 000; NOMA Children Hospital, Sokoto, N95,258; Institute of Chartered Chemists of Nigeria, N67,995; and the Nigeria Centre for Disease Control, N13,053. On the other hand, the sum of N3,527,555 has been allocated to the Ministry of Labour and Employment for sewage charges. While the Ministry of Labour and Employment headquarters got N1,580,388, the National Directorate of Employment, Industrial Arbitration Panel, the National Productivity Centre and the Michael Imoudu Institute of Labour Studies budgeted N1.3m, N407,171, N242,000 and N240,000 respectively as sewage charges. The budget also captured N2,444,519 as proposal for sewage charges under the headquarters of the Ministry of Niger Delta Affairs. The Ministry of Education, on the other hand, plans to spend N38m on cleaning and fumigation of its headquarters in Abuja in 2017. It will also spend N4.8m on clearing of sewage as indicated in its 2017 budget breakdown. Its total allocation for the year stands at N17.9bn. The Ministry of Foreign Affairs proposes to spend N18m on fumigation and N2.52m on clearing of sewage in the New Year. Its total allocation is put at N13.1bn. The Ministry of Interior said its sewage charges would gulp N1,400,582, while cleaning and fumigation would take N9.5m. The ministry has a budget of N11.9bn. On the other hand, the Nigeria Police Force expects to spend N30m for sewage clearing at all its formations and commands nationwide, while cleaning and fumigation will cost N20.1m. The Force has a total allocation of N323.1bn, made up of N9.25bn for overhead; N297bn for personnel; N307bn for recurrent; and N16.2bn for capital projects. The Police College, Wudil, Kano, proposes to spend N800, 000 on sewage clearing and N1.8m on cleaning and fumigation. The Nigeria Security and Civil Defence Corps plans to spend N240,000 as sewage charges and N2.160m for fumigation in 2017. The service has a total budget of N69.4bn. The Nigeria Immigration Service, in its budget, allocates N2.9m for sewage charges and N12m for fumigation out of its total budget allocation of N54.6bn. Provision of water and sewage network in prisons will cost N153.7m in 2017 out of the total allocation of N72.3bn for the Nigerian Prisons Service. The Ministry of Power, Works and Housing, including its agencies, is to spend N79.33m on sewage charges and cleaning/fumigation services in 2017. The ministry headquarters will spend the highest amount of N28.76m, followed by the Federal Road Maintenance Agency, N23.92m; while the National Power Training Institute is allocated N1.3m. Of the 14 agencies captured in the ministry, seven have no allocation for the services under review. The Federal Ministry of Agriculture has 41 agencies, which include the ministry’s Abuja headquarters. A total of N72.25m is to be spent on sewage charges and cleaning/fumigation services by the ministry and its agencies. While 16 of its agencies have no allocation for the highlighted services, the Nigeria Stored Products Research Institute, Ilorin, has the highest budget of N10.73m, followed by the National Centre for Agricultural Mechanisation, Ilorin, N7.41m. The lowest allocation of N141,600 goes to Federal College of Land Resources Technology, Kuru, Jos. The Federal Ministry of Water Resources provides a budget of N51.74m for sewage charges and cleaning/fumigation. It has 17 agencies, including the ministry’s headquarters, but four do not get any allocation for the services in the 2017 budget. The highest allocation of N13.58m goes to Nigeria Integrated Water Resources Management Commission, followed by N10.33m for the ministry’s headquarters, while the lowest was N100,000 for Chad Basin River Development Authority. The Ministry of Mines and Steel Development and its 10 agencies will spend N114.1m on sewage charges and cleaning/fumigation services. The ministry’s headquarters has the highest allocation of N37.15m, followed by Nigeria Geological Survey Agency, N31.51m, while the lowest amount of N2m is allocated to the National Iron Ore Mining Project, Itakpe. For the Ministry of Environment, N133m is budgeted for the services under review. Of its 19 agencies, including the ministry’s headquarters, only one does not get allocation for sewage charges and cleaning/fumigation services. The ministry’s headquarters gets the highest allocation of N61.01m, followed by the N17.03m allocated to the Forestry Research Institute of Ibadan, while the lowest allocation of N307, 840 goes to Kamuku National Park. The Ministry of Petroleum Resources has six agencies, including the ministry’s headquarters, and is to spend N50.42m on the services. But unlike most ministries, the headquarters of the FMPR has no allocation for sewage and cleaning/fumigation services. The highest allocation for the services under review went to the Department of Petroleum Resources as the agency is to spend N38.45m, followed by N4.55m to be spent by the Petroleum Products Pricing Regulatory Authority. The lowest allocation of N1.58m goes to the Nigeria Nuclear Regulatory Authority. The Federal Ministry of Transportation and its agencies will spend N36.62m. Of its nine agencies, including the ministry’s headquarters, four do not get any allocation for the services being considered. The ministry’s headquarters gets the highest allocation of N29.5m. The second highest allocation of N2.76m is for the Accident Investigation Bureau, while the lowest budget, N828, 000, goes to the Council for the Regulation of Freight Forwarding in Nigeria. The Federal Ministry of Information and Culture proposes to spend N1,086,693 on sewage charges. There are 13 agencies under the ministry which also plan to spend a total of N14,396,122 as sewage charges. The Nigerian Tourism Development Corporation and the News Agency of Nigeria have the highest budget proposal for sewage charges. NTDC proposes N2, 769,072 while NAN plans to spend N2, 580,000 as sewage charges. The rest are the Voice of Nigeria (N1,176,660); Nigerian Film Corporation (N261,444); National Broadcasting Commission (N889,999); Nigeria Press Council (N255,858); National Troupe of Nigeria (N233,011); National Theatre (N1.2m); National Gallery of Art (N750,000); National Institute of Hospitality and Tourism Development Studies (N1,361,801), and National Institute for Culture Orientation (N868,277); National Orientation Agency (N800,000) and National Council for Arts and Culture (N2m). The Federal Ministry of Justice also plans to spend N3,784,596 as sewage charges for year 2017. Two other organisations under the ministry, the Council of Legal Education and the National Agency for the Prohibition of Traffic in Persons, propose a total of N1.75m for the same purpose. While the Council for Legal Education budgets N900, 000, NAPTIP proposes to spend N850,000 for it. Other agencies under the Justice ministry, comprising, the Nigeria Law Reform Commission, the Legal Aid Council, the Nigeria Institute of Advanced Legal Studies, the Regional Centre for International Arbitration, National Drug Law Enforcement Agency and National Copyright Commission, do not have budgets for sewage charges. The Ministry of Youth and Sport Development also proposes N1,872,696 as sewage charges for 2017. This is apart from the amount other agencies under the ministry have proposed for the same expenditure. Three agencies under the ministry plan to spend N3,500,000. The three agencies are the Citizenship and Leadership Training Centre (N200, 000); the National Youth Service Corps (N2.6m), and the Nigeria Football Federation (N720,000). The National Institute of Sports has no budget for sewage charges. The Ministry of Defence and the agencies under it, including the Nigerian Navy, the Nigerian Air Force and the Nigerian Army, plan to spend a total of N225.64m on fumigation, sewage charges, and clearing of sewage in 2017. The Ministry of Women Affairs and its parastatals, on the other hand, plan to spend N15,677,004 on similar services while the Ministry of Communications and one agency under it plan to spend N29,340,637 on the services. While the ministry headquarters will spend N17,355,053, the Nigerian Communication Satellite Limited will spend N11,985, 584 on cleaning and fumigation services.